The universe seems to be left-handed, showing a fondness for this direction in the way a particle spins as it decays. 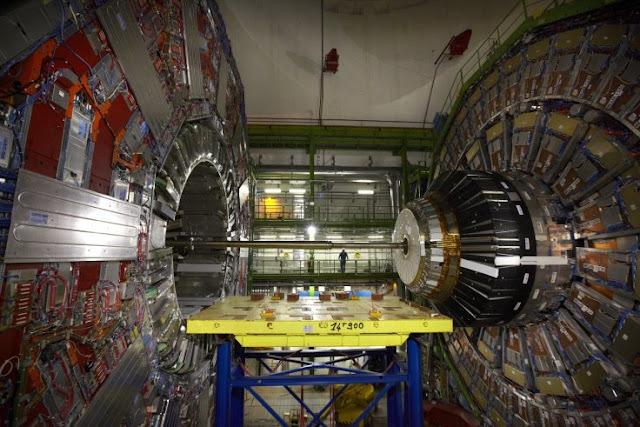 Scientists at CERN's Large Hadron Collider (LHC) were looking at the behavior of a particular particle, lambda b baryon, as it decayed via weak nuclear force, one of the four major forces in the cosmos. The group, from the LHCb Collaboration, were actually looking to find out how the weak force decays this particular particle into lighter particles in order to get a better understanding of the behavior of matter in the cosmos and also the nature of dark energy. Physicist Ulrik Egede, from Imperial College London's Department of Physics, clarified the 'handedness' of the cosmos together with variances between matter and antimatter is essential to understanding how the universe evolved. Ulrik Egede said: "Our results show that the decay does indeed behave in a left-handed way. Because the weak force is the only one of the fundamental forces to distinguish between right and left, we can also say that the universe has a left-handed bias. Although this left-handedness is predicted by the widely accepted Standard Model of physics, it has also been refuted by some physicists in recent years. We now need to explore other decays to understand why past measurements gave inconsistent results with a purely left-handed decay." In the past, researchers had proposed if right-handed quarks were involved in decay too, this would propose other forces are at work in the cosmos on top of the four vital forces in the universe i.e. electromagnetism, gravity, weak nuclear, and strong nuclear force. The results, issued in the journal Nature Physics, demonstrate any new fundamental force that is right-handed is not involved in decay. Greig Cowan, co-author on the research paper, said: "Our results show a clear left-handed bias, which pulls us away from this line of enquiry and indicates that we need to look elsewhere to answer these fundamental questions about the universe."